Everybody knows that February is "slack season" when it comes to quilt shows... or is it? 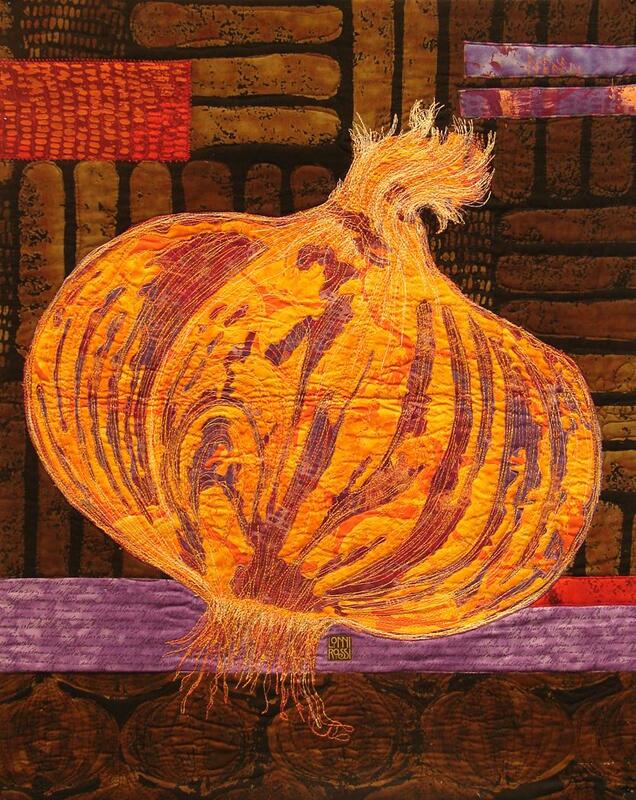 There are more than a dozen quilting events this month that captured our attention. How about the International Quilt Show in Dubai, or one of the six shows in Florida, for all the snowbirds* out there? Row 1, L-R: Quiltfest Trail, Llangollen (Feb 1-29, North Wales, U.K.); Second Lives, The Age-Old Art of Recycling Textiles, opening Feb 4 at the Textile Museum (Washington, D.C.); International Quilt Show Dubai 2011 (Feb 7 - March 5, Dubai). Row 2: 'Over Here' Quilt Exhibit, Rocky Mountain Quilt Museum (opening Feb 1); San Francisco Quilters Guild, Symphony of Color (Feb 26-27, California); Mid-Atlantic Quilt Festival XXII (Feb 24-27, Virginia; Pat Holly's winning 2010 quilt is shown). Row 3: Hummingbird Quilt Guild (Feb 26-27, Arizona); Peace River Quilters Show (Feb 25-26, Florida); Quilters’ Crossing of Palm Harbor (Feb 11-12, Florida). Row 4: Space Coast Quilters Guild (Feb 11-12, Florida); 14th Annual Priceless Pieces Quilt Show, Teacup Quilters (Feb 17-Mar 26, North Carolina); St. Andrew’s Bay Quilter’s Guild Show (Feb 11-12, Florida). Also see: Quilts 2011, Lake Metroparks Farmpark Quilt Show (Feb 11 - March 13, Ohio); Wichita Mountain Quilt Guild (Feb 18-19, Oklahoma); Kitsap Quilters Quilt Show (Feb 18-19, Washington); Stonestead Outdoor Quilt Festival (Feb 6, Upper Hutt, New Zealand); 17th Annual Quilt Gala, Horry County Museum (Feb 25-26, South Carolina); Corpus Christi Quilters Show (Feb 25-26, Texas); 15th Annual Fiber Arts Show, Shadow Mountain Quilters (Feb 18-20, Nevada); 12th Triennial Quilt Show, Amelia Island Quilt Guild (Feb 25-26, Florida). 1. Any of several birds, such as the junco and the snow bunting, common in snowy regions. 2. Slang: One who moves from a cold to a warm place in the winter. p.s. 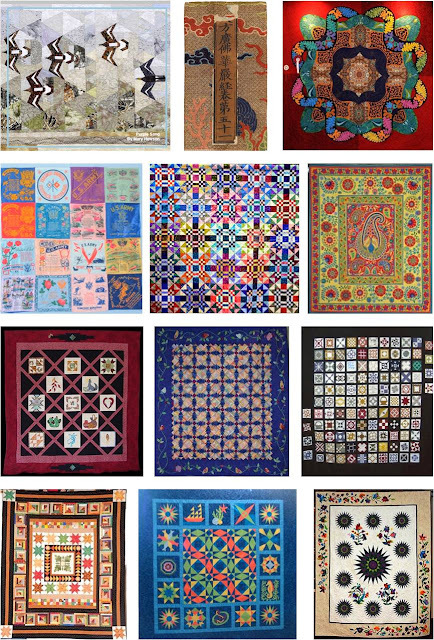 Quilts Dubai has some wonderful online galleries with photos of past award winners. This lovely red-and-green album quilt from the mid-1800s belongs to Gay Bomers, and it has captured the hearts of many quilters since it was introduced as a block-of-the-month at Sentimental Stitches. There is even a dedicated Beyond the Cherry Tree blog for BTCT enthusiasts! The quilt has fifteen blocks, each measuring 16-1/2 inches, and the size of the finished quilt is 98 1/2″ × 98 1/2". 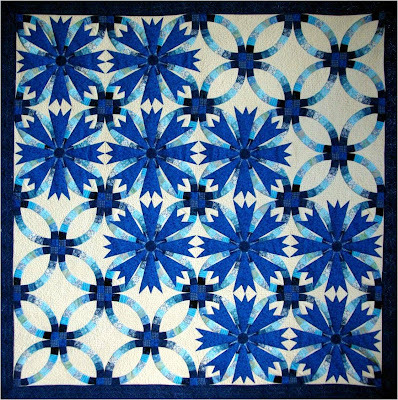 Gay Bomers has carefully documented each block, including the unique quilting designs, and has created full size patterns that are provided with a color photo from the antique quilt. The block patterns are available in the Sentimental Stitches online shop. 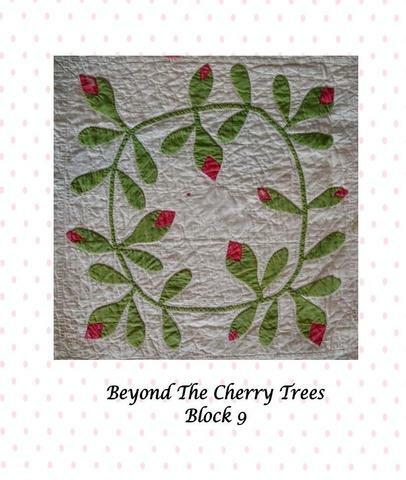 Beyond The Cherry Trees was the first project in the "Polka Dot Garden" series. Gay Bomers says: "The Polka Dot Garden is a series of projects that touch my heart and feed my hunger for all things polka dot. Some will be large, some small, some quilts, some not. I promise they'll all be fun!" Image credits: Images are shown with the generous permission of Gay Bomers. 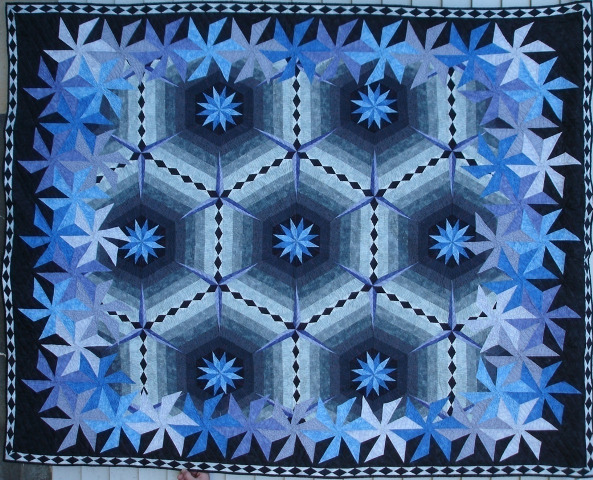 We're wrapping up "The Blues" with a look at the dazzling quilts we've featured over the last two weeks. And, we've come to a few conclusions. First, we love the color Blue, in all its manifestations. Second, we are captivated by bold graphic designs with high contrasts: there is nothing bland about these quilts! Finally, just looking at these quilts makes us feel serene and hopeful... which means that color psychology is for real! Top row, L-R: Bachelor’s Wedding Ring, by Eric Gunson, at Pieceful Expressions; Kaleidoscope, the 2010 ASIJ Auction Quilt by Julie Fukuda and colleages, as seen at My Quilt Diary; Yuletide Snowflake design, by Joanna Figueroa, at Fig Tree Quilts (the quilt shown was made by Connecting Threads). Row 2: Glowing Splendor, by Barbara Cline, at Delightful Piecing; Teacup, by Maria Elkins, at Maria Elkins Art Quilts; Embroidered Japanese Crests, by Susa Glenn, at Susa Glenn Designs. Row 3: Victorian Gingerbread, by Janice Lee Baehr, at Pacific Rim Quilt Company; Albers at Sea, by Debra Levin, at the Empire Quilters Guild; Delft Storm, by Ionne McCauley, at Ionne Quilts. At Original Art Quilts by Maria Elkins, this gifted artist explains that more than half her fabric stash is blue and white. We imagine that this is true of many quilters, as there are so many different shades of blue ; and neutral white is such an important component of quilt backgrounds and foregrounds. We think that teacup quilt patterns are really adorable and so much fun, because they are a chance to get in touch with our "inner child" and hark back to our girlhood days of playing "tea party" with our dolls and stuffed animals clustered around us. 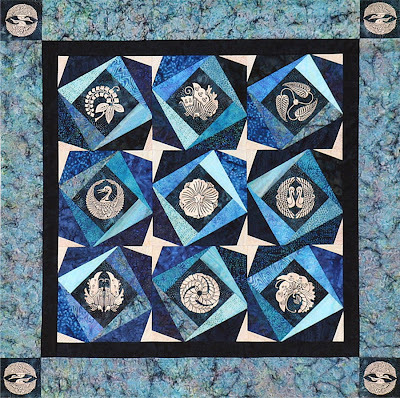 The enchanting, highly original, "Teacup" quilt above was created by Maria Elkins in 2002, when her quilt guild challenged its members to create a quilt using only blue or white. 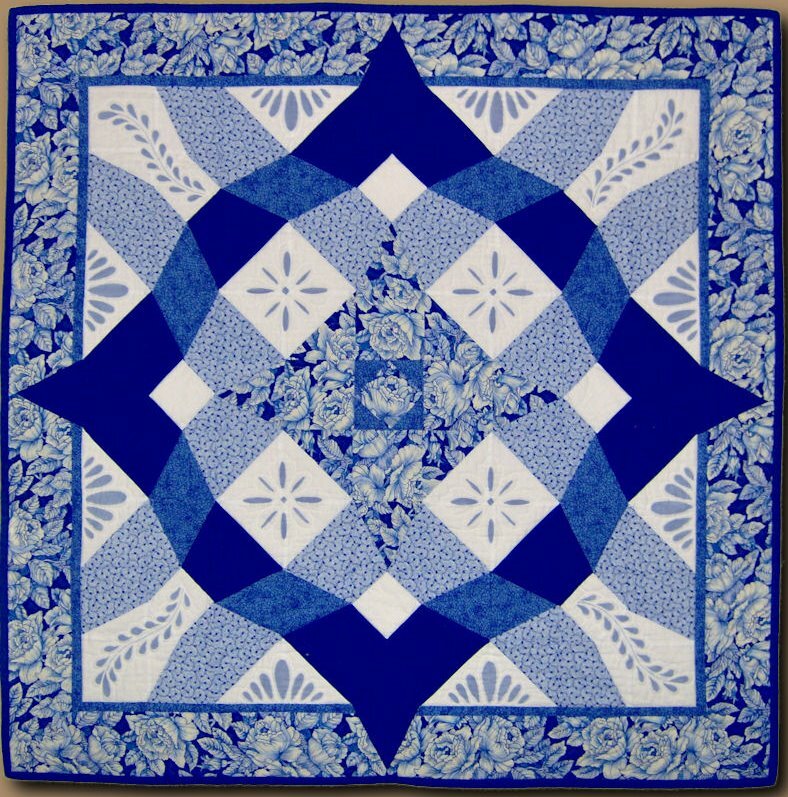 In addition, there was one blue and white fabric which everyone had to use; and that is the fabric on the upper right and left hand corners of the quilt. Maria explains at her website that she machine pieced the curves of the cup and saucer, then she used a print fabric of blue and white plates to cut out, fuse, and machine applique them. They form a row of fanciful scallops around the perimeter of the plate. 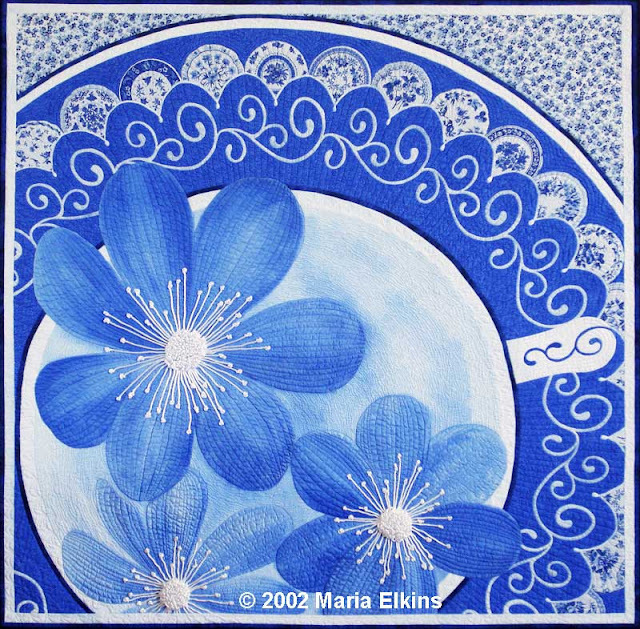 On fabric, she hand painted the hepatica flowers and the water surface of the teacup, then she appliqued them to the cup and saucer, using rayon rattail cording for the centers of the flowers. She stenciled the scrollwork using Setacolor and Lumiere paints. 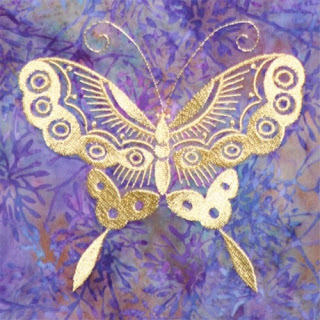 This magnificent work was then quilted with metallic, rayon, and invisible threads. In addition to creating her unique, innovative, quilts, Maria also gives lectures and presentations. She is also the author and producer of a wonderful DVD, Making Faces, available at the Interweave Store (also, check out the Interweave coupon page). In this workshop, Maria, teaches how to edit and embellish your photos with computer software to create fashion portraits with fused applique. She then explains how to use a photo to draw faces on fabric with colored pencils, pens, fabric paints, or inks. Image credits: The quilt images are the copyright of Maria Elkins and are shown with the generous permission of the artist. What would a series on blue quilts be, without a storm at sea (or two)? This sophisticated quilt really caught our eye. It has the spare, minimalist design of a classic Amish quilt, with a very contemporary feel. Storm at Sea is one of our favorite blocks, as it falls into the category of "straight piecing patterns that appear curved." We love the checkerboard and folded ribbon borders ! The quilt was done in Cherrywood hand-dyed fabrics in blues, greens and wine. The background is not black; it is a dark burgundy color. Debra explains the quilt name in reference to the artist, Josef Albers: "I was thinking of his 'homage to a square' color theory series about how the same color looks different when surrounded by different colors. So in this case the burgundy is against various colors -- I liked using the traditional 'Storm at Sea' pattern to make this point." 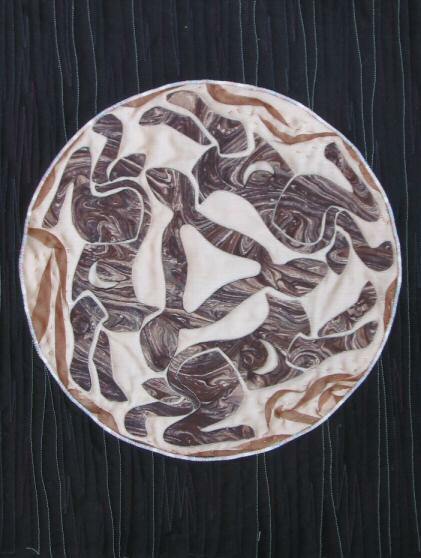 The back of the quilt, shown below, is an abstract work of art. Image credits and links: Images are shown with the generous permission of Debra Levin and the Empire Quilters Guild. 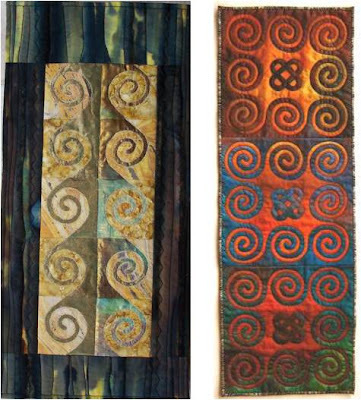 More of Debra Levin's outstanding quilts can be see on this Quilter-of-the-month page. The next Empire Quilters Guild Urban Inspirations Quilt Show will be held March 26-27, 2011 in New York City. When we hear the word "Delft" , it brings to mind the magnificent blue and white pottery traditionally produced near the town of the same name in the Netherlands. The intense blues of Delftware were achieved by painting the pottery with a solution of salts of cobalt oxide; and we see that same mesmerizing cobalt blue color here, in its purest form. "Delft Storm" incorporates medallions and diamonds of varied sizes and angles to produce an undulating, swirling effect that reminds us of white-capped waves on a wind-whipped blue lake. Ionne has created the deep cobalt medallion as the focal point. She enhances the luminous, dimensional quality of this work by using a medium value fabric at the point where the medallion intersects the pale blue ribbons. It is this sense of movement and transparency which creates a captivating work that is both elegant and energetic. 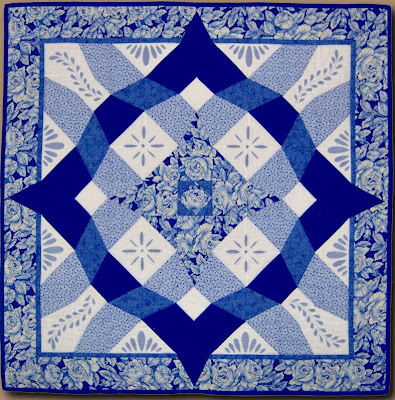 "Delft Storm", along with "Blue Plaid Shirt", another lovely monochromatic quilt, can be seen in Ionne McCauley's online gallery of traditional quilts. Ionne McCauley along with Sharon Pederson, is also the author of Color for the Terrified Quilter. 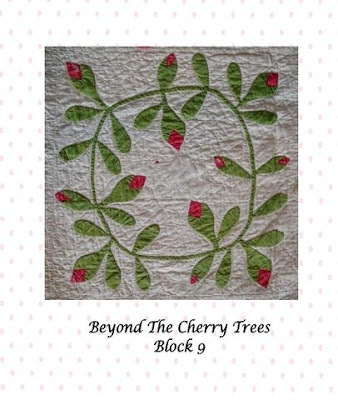 This is a fabulous book of eleven different, intriguing Nine-Patch projects. 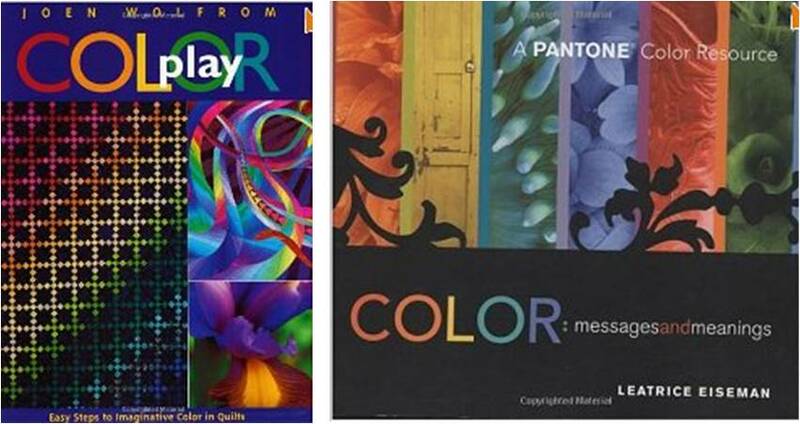 Ionne provides so much useful information about color combinations and value differences which make a successful, eye-catching quilt. Color For The Terrified Quilter is highly recommended by students and teachers alike. Ionne has a fascinating and rich background in clothing design, quilt design, teaching, and dyeing and painting her own fabrics. She draws her inspiration from the magnificent scenery and nature surrounding her home on the west coast of Canada. Image credits: The quilt image is the copyright of Ionne McCauley and is shown with the generous permission of the artist. The pairing of blue and white has resulted in some of the most dramatic textiles around the world. Here is a quote that sums up the tradition of blue and white: "The cosmos is blue and white. Skies are blue, clouds are white; oceans are blue, waves are white. The whole cosmic message is blue and white, all over the world. There are very few countries that don't have a blue and white tradition." 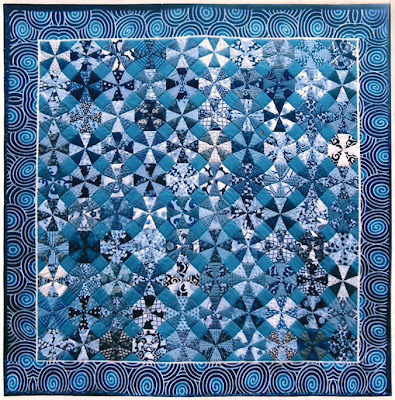 The stunning quilt by Susa Glenn, below, gives us a chance to talk about blue-and-white color schemes and about extraordinary embroidery designs. 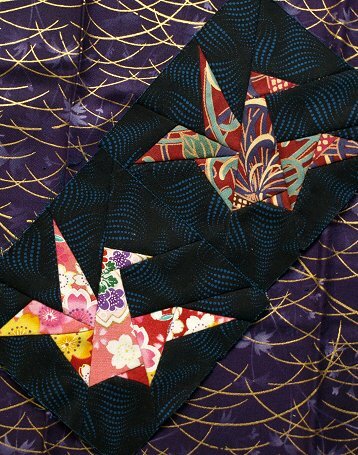 Each block is richly embroidered with a different ancient family crest from Japan. 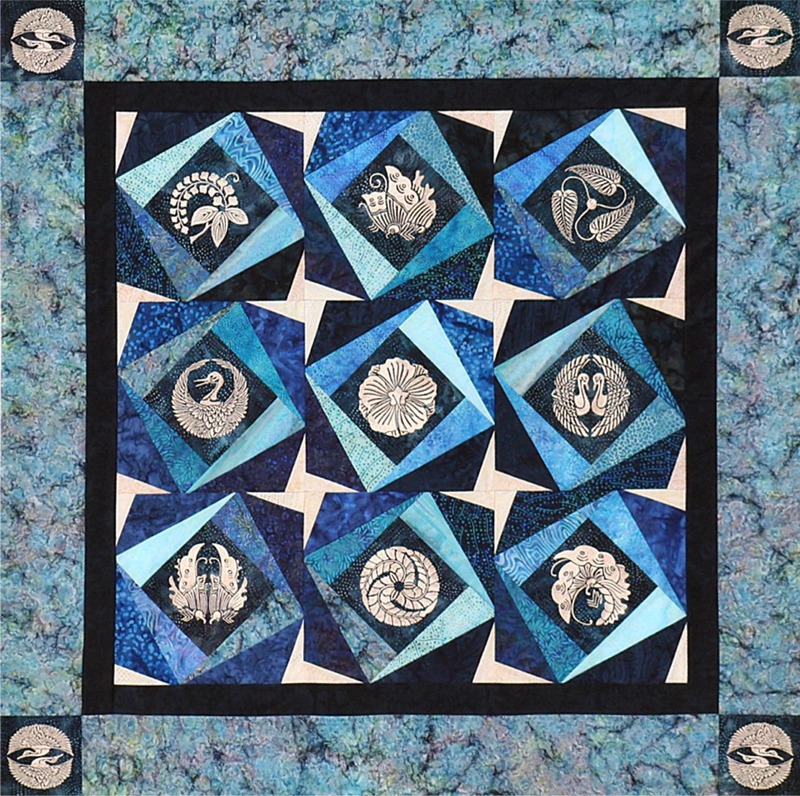 The Japanese Crests bundle includes twelve unique designs on a CD or as a download, and the bundles include the instructions for the gorgeous quilt project shown above. At Susa Glenn's site you can find digitized designs for wildflowers, cowboy crests, skeleton leaves, bugs, morning glories, continuous line designs, and many more. Here is a close-up of an exquisite Oriental Butterfly. In addition to her gorgeous embroidery designs and projects, Susa Glenn has provided some great machine embroidery tips and tutorials. Image credits and links: Images are the copyright of Susa Glenn Designs and are shown with permission. The quote in the first paragraph is by Amy Sylvester Katoh, the owner of the shop called Blue and White in Azabu Juban, Tokyo; she is the author of four books including Blue and White Japan . Q: If you combine the ornate architectural decoration known as "gingerbread", with the Hawaiian style of quilt construction, what do you get? 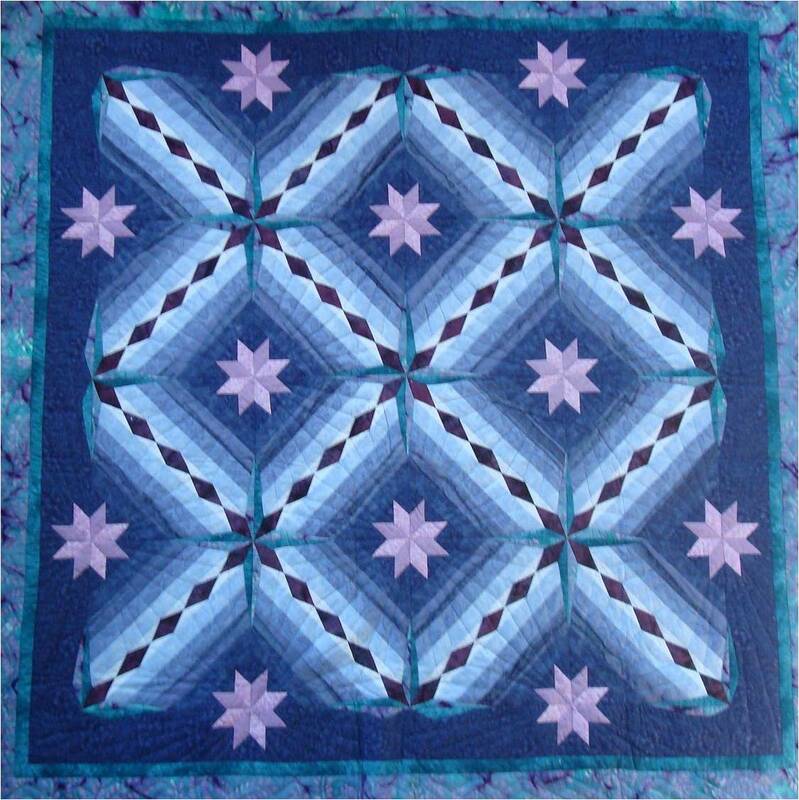 A: The blue Victorian Gingerbread quilt shown below. The term refers to a particular 1860's style of architecture, when buildings were lavishly decorated with hand-carved latticework. 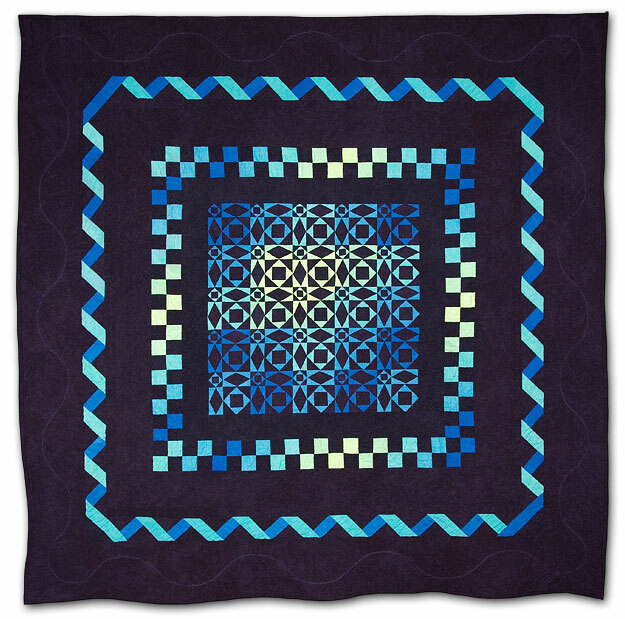 This blue quilt has a mystical quality that reminds us of a city silhouetted against the sky at twilight. In Hawaiian quilts, the applique design is cut all at one time from a single piece of fabric; this 'snowflake' method creates symmetrical repeats, like the ones seen in the four corners of the quilt. As with most Hawaiian quilts, only two colors or shades of fabric are used in the construction. The pattern and a kit for Victorian Gingerbread are available at the Pacific Rim Quilt Company, which is famous for their extensive line of Hawaiian patterns, fabric packs and instructional videos. Image credit: The quilt image is shown with the generous permission of Janice Lee Baehr at the Pacific Rim Quilt Company. 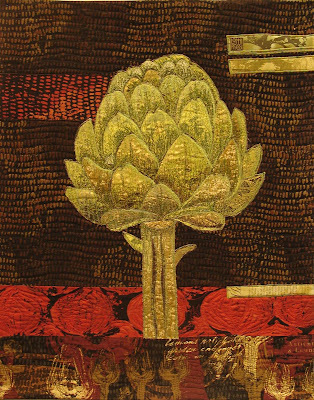 We previously featured PRQC, and a breadfruit quilt by Nancy Lee Chong, in our feature article on Hawaiian Quilts. 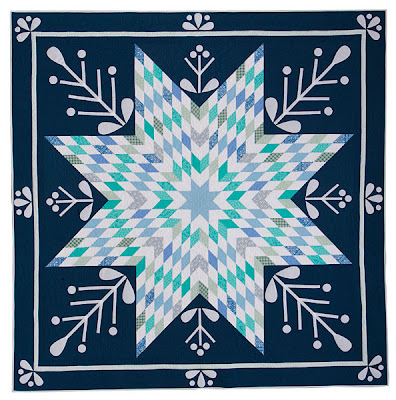 The stars shine brightly in today's brilliant blue quilts by designer, quilter and author, Barbara Cline. 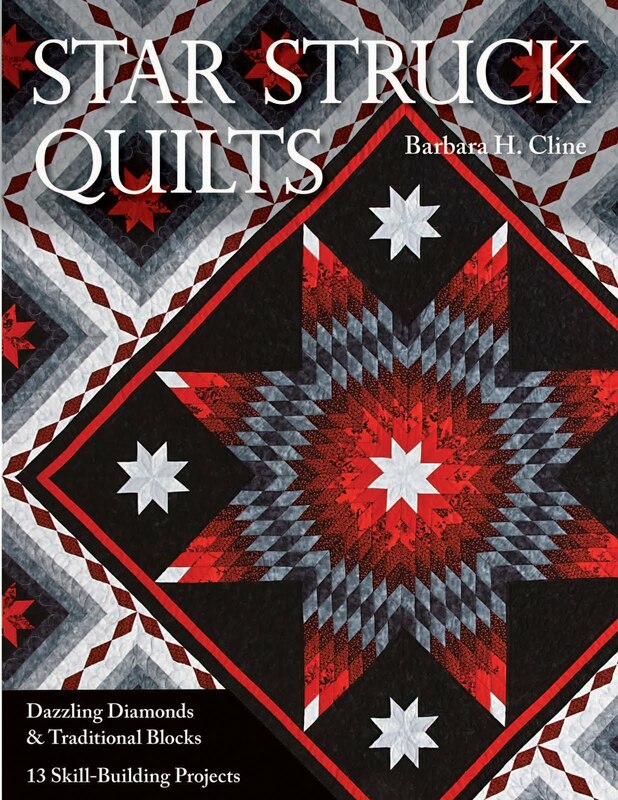 Stars appear in nearly all of her quilts, including the lone star designs in her book, Star Struck Quilts. 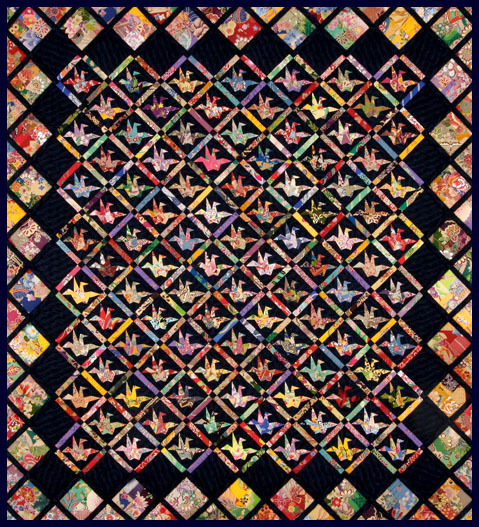 Barbara Cline's starry quilts remind us of a quotation by Mary C. Crowley, who said: "Every evening I turn my worries over to God. He's going to be up all night anyway." "Glowing Splendor" can be seen in Barbara Cline's online gallery. Here we see a dimensional effect created by gradated blue fabrics that are pieced as hexagons, with 12-pointed stars in the centers. At the intersecting corners of the hexagons there are 3-pointed dimensional stars that look like the blades of a wind turbine. 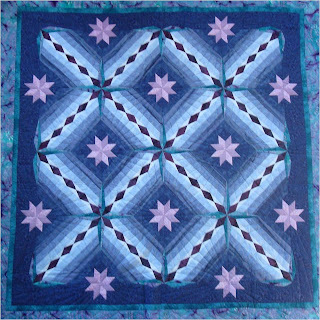 The inner border of the quilt is formed by whirling pinwheels in five different blue hues, which are set in a tessellating pattern, as in Barbara Cline's Pinwheel Spin pattern. The gradation of background fabrics from dark blue to white gives this quilt a beautiful dimensional effect. 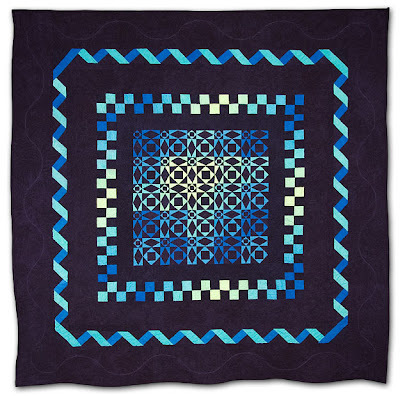 The blue-black diamond chain running diagonally through the quilt creates an optical illusion, making it look as if the chain is moving! The pattern for Diamond Chain is available at Delightful Piecing. Although the pattern appears to be complex, Barbara assures us that it is easy to piece when it is broken down into 10" blocks ! Image credits and links: Images are shown with the generous permission of Barbara Cline. 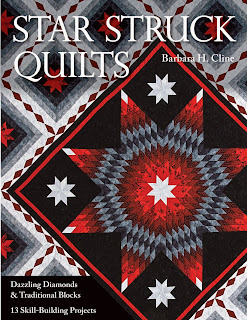 She is the author of Star Struck Quilts - Dazzling Diamonds & Traditional Blocks , published by C&T Publishing. 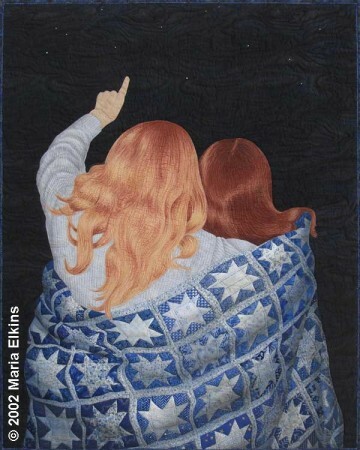 Fittingly, the Amazon.com reviewers of "Star Struck Quilts" all gave it five stars ! No, we're not talking about music. We're talking about a gorgeous blue kaleidoscope quilt done in Japanese fabrics. In fact, it is one of the most beautiful blue quilts - and kaleidoscope quilts - we've seen! We came across this masterpiece at Julie Fukuda's blog: My Quilt Diary. 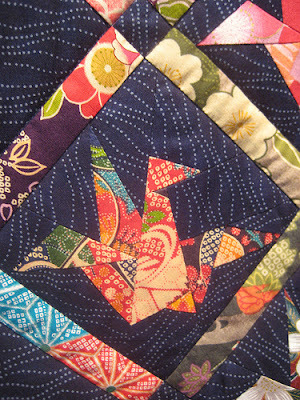 One hundred blocks were cut by volunteers, using a wide selection of Japanese fabrics including yukata fabrics. 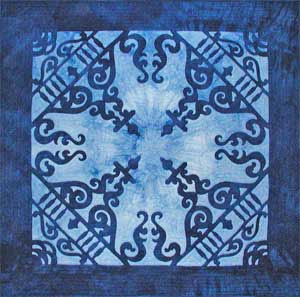 The quilt has a dynamic arrangement of textures, dark and light values, and beautiful blue hues. 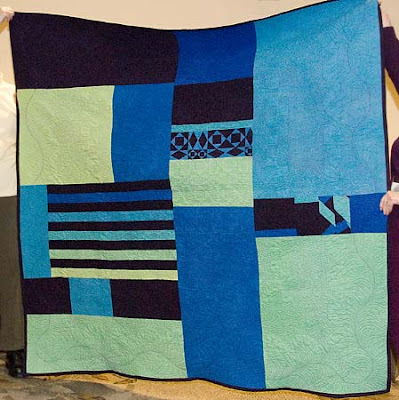 From looking at the quilt is obvious that the blues are all compatible. A quick color analysis shows that the main colors are 'tones' of cerulean blue (cerulean blue plus gray). We asked Julie about the professional-looking design, and we were amazed to hear that not even a design wall was used. She says: "Although it looks well planned, we just cut the fabric and matched up darks and lights. After the blocks were all sewed, we arranged them on the floor until everyone was satisfied and then joined them in rows. We work at the school or a community room or whatever space we can find and some work is taken home between weekly meetings. No design wall." All of the quilts that have been made for the ASIJ Auctions are posted on the ASIJ pages at Julie Fukuda's blog. Julie says: "There is a great deal of 'ownership' among those who work on the project and the quilt is one of the auction items bringing lots of bids and a high price. The work group is made up of mothers of kids at the school and changes from year to year as people move in and out of Tokyo. The volunteers are all of my daughters' generation and with my own daughters being so far away, these women fill a great gap. Each year we welcome newcomers to life in Tokyo and say farewell to others." You can see the group working on the 2011 quilt here. Image credits: The image is shown with the generous permission of Julie Fukuda. She was born in Cleveland Ohio, and moved to Tokyo in 1963. She is a mother to six grown kids and grandmother to seven. Regarding her beautiful hand quilting, Julie says: "My house is too small to accommodate a sewing machine so everything I make is by hand." Today's beautiful blue quilt is "Yuletide Snowflake", 82-1/2 x 82-1/2, based on the pattern by Joanna Figueroa and Sue Falkowski at Fig Tree Quilts. The quilt shown below was made by Connecting Threads. 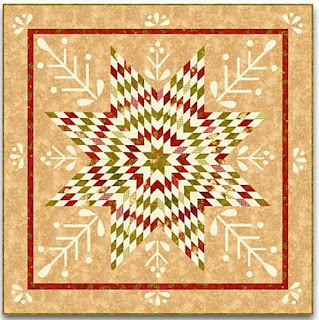 The Yuletide Snowflake pattern is a beautiful, traditional Bethlehem Star that looks very challenging to piece. As quilters, we are aware of the difficulties in joining small pieces of diamond shapes together, since they are cut on the bias and easily stretch at the places where 3 points must be sewn together simultaneously. 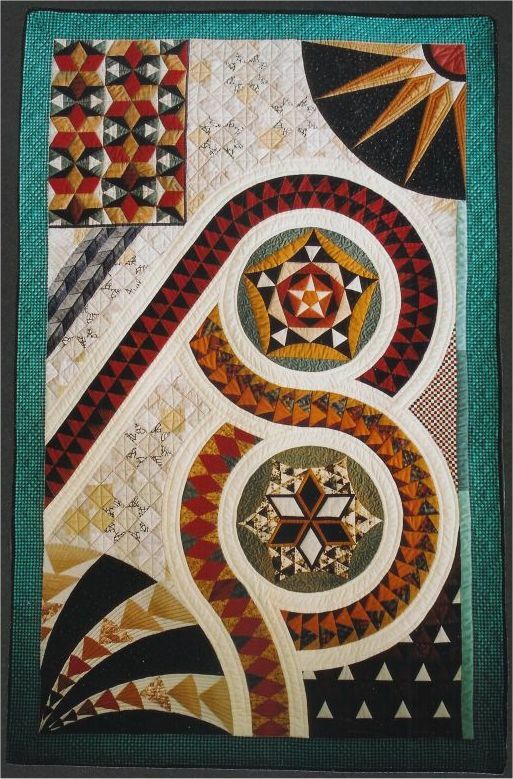 ﻿Star quilts like this are usually thought of as a pattern for advanced quilters, but Joanna and Sue have figured out a way to create this star without using a diamond template or needing to join the three-point "y-seam." To make the construction process even simpler, one could use pre-cut Jelly Roll strips. Joanna remarks, "The Star would be even wonderful on its own without any snowflake appliqued 'stems' on the corner if you like." We see many possibilities in this pattern, as it could really be a star for all seasons. 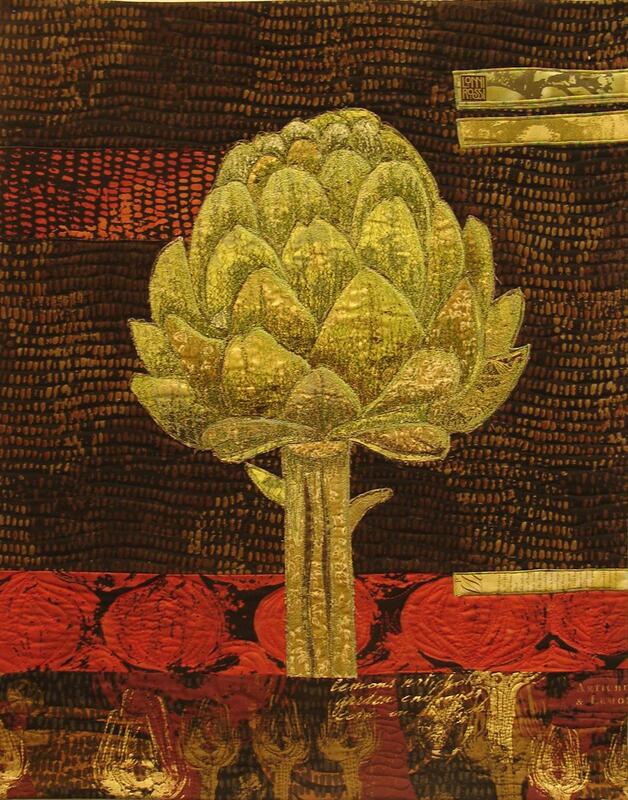 Here is the warm color scheme shown on the Fig Tree Quilts pattern cover. Think how pretty this pattern would be in soft summer colors of raspberry sherbet and sage green, on an ecru background. It would also be perfect for springtime in colors of lemon yellow, lavender, and lime.This quilt lends itself beautifully to complimentary or triadic color schemes. How many color combinations can you imagine for this pattern? 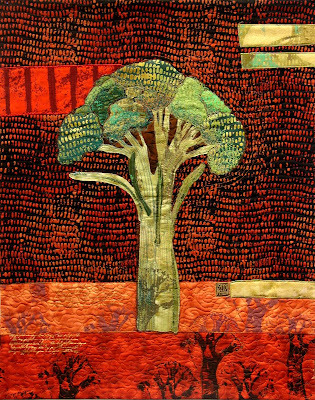 Image credits: Images are shown with the generous permission of Joanna Figueroa, Fig Tree Quilts, and Connecting Threads. In addition to patterns, Joanna designs fabric collections for Moda Fabrics. She is currently working on her 17th collection! 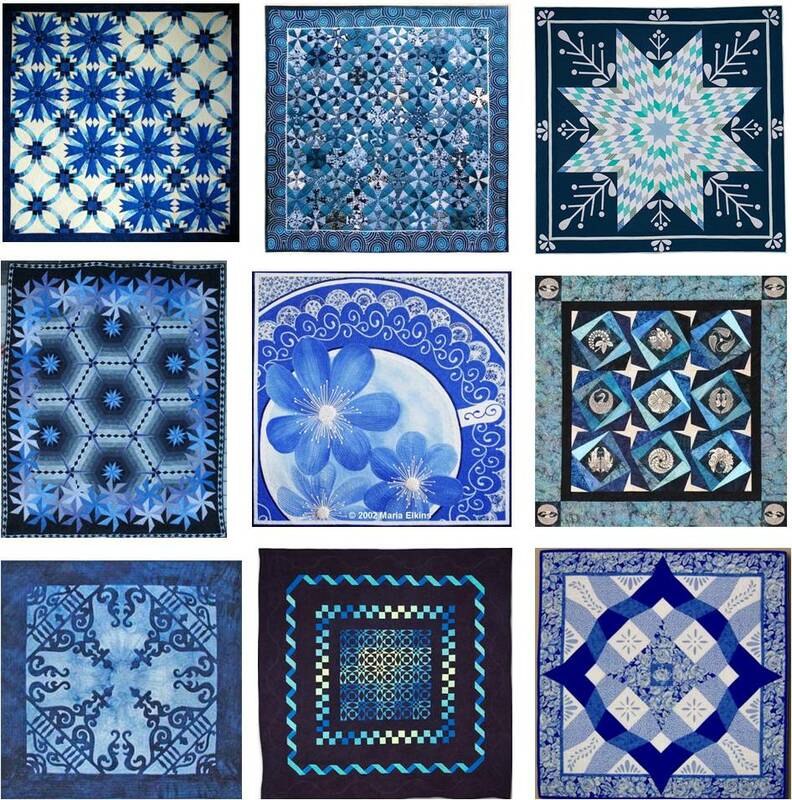 The hues in the blue range have been shown to have the highest preference among people. Blue is beneficial to mind and body, causing a decrease in heart rate and blood pressure. Blue is thought to suppress appetite; if you put your food on a blue plate, you will eat less. (This does not explain the blue plate special !) Joen Wolfrom says that blue is the most popular color for a monochromatic design: "Blues create refreshing, airy, and serene moods. They can suggest sophistication, elegance, and formality." Finally, blue is a traditional symbol for weddings. Have you heard the saying "Marry in blue, lover be true" ? The symbolism and psychology of 'blue' are embodied in this stunning new design. The Bachelor's Wedding Ring pattern combines a traditional favorite, the Wedding Ring pattern, with sparkling flowers that reflect Eric Gunson's love for wildflower photography. He creates all of his designs on the computer, and he sees his craft as a combination of graphic arts and sewing. He is the lead designer at Pieceful Expressions, his family's business in Sisters, Oregon (see About Us). Recently, Eric was chosen to design the 2011 Sisters Outdoor Quilt Show Raffle Quilt! To learn more about Eric Gunson, see the fun article called Breaking the Quilting Gender Gap. Image credits and additional links: The copyrighted image of Bachelor's Wedding Ring is shown with the generous permission of Eric Gunson. Previously we featured Nine Beauties Dancing, a Pieceful Expressions design by Nicole Gunson, in an article on Batiks and Stars - A Match Made in Heaven. The quote by Joen Wolfrom is from the book ColorPlay . 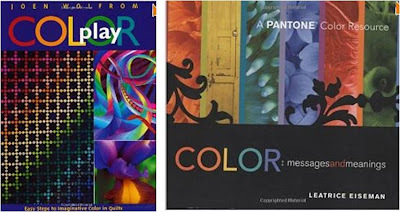 Also check out Color - Messages and Meanings- A PANTONE Color Resource . Finally, stay tuned this week and next for more beautiful Blue quilts! Lonni Rossi is an internationally known fabric designer, color specialist, art quilt maker, pattern designer and teacher. 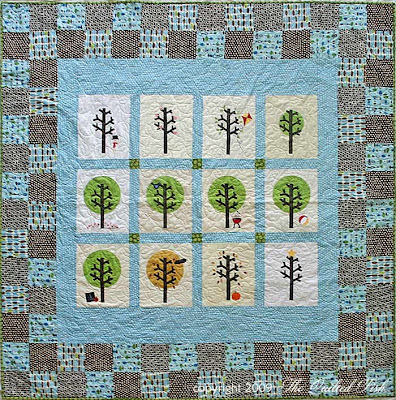 While we were preparing an Ode to a Tree, we came across this Lonni Rossi quilt and marked it as a 'favorite'. Then we discovered it wasn't a tree... it was a giant broccoli ! 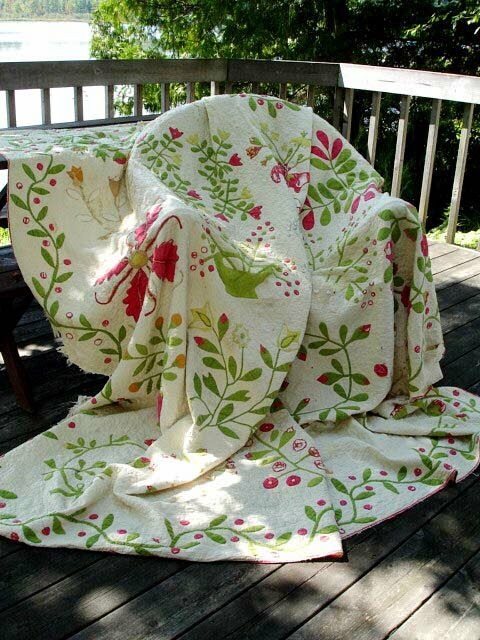 We asked Lonni Rossi about her inspiration for the Broccoli Quilt, and she explained: "A few years back I created a fabric line for Andover Fabrics called Cultivated Cottons (which is now out of print). All of the images in the collections were created by using actual vegetables as stamps. I usually make several quilts to showcase my new lines of fabric so it just seemed natural to make quilts inspired by vegetables!" The vegetables include a giant artichoke and and a colorful onion (below). Wouldn't they be fantastic as a set of three? 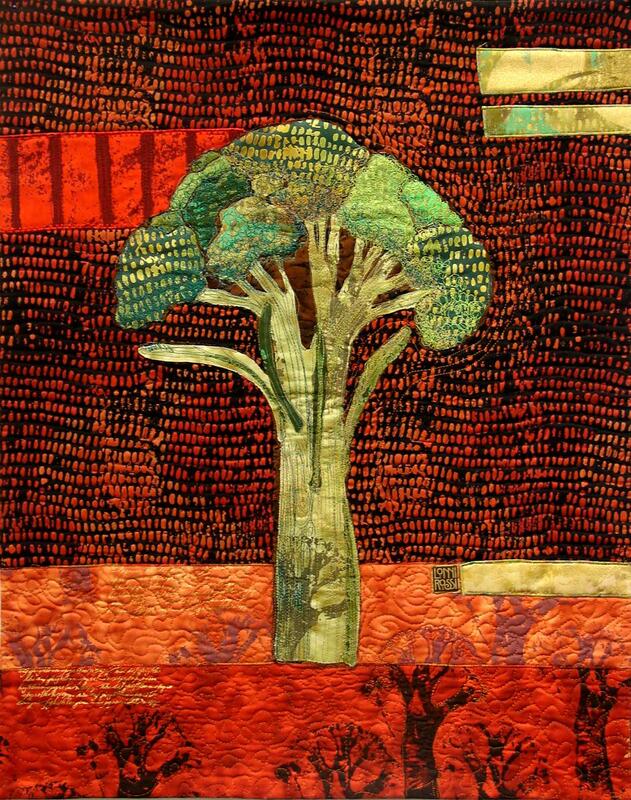 Lonni Rossi has participated in many group shows locally and nationally, and has had one-woman art quilt shows in Philadelphia, Munich and London. For more information see her Facebook page. Finally, we couldn't stop thinking about the Broccoli that reminded us of a tree. 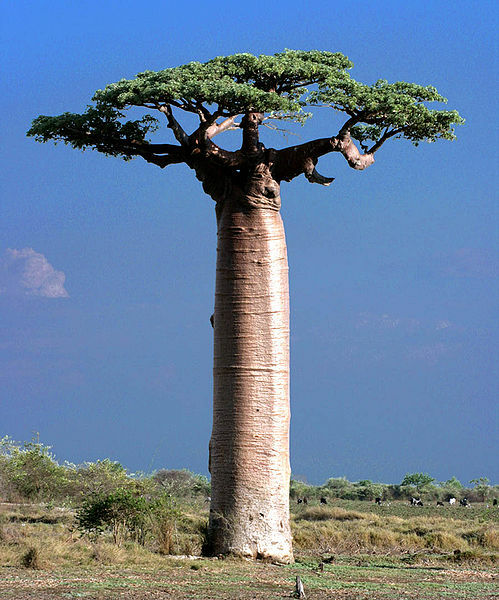 To prove that we're not crazy... here is a tree that looks like a Broccoli ! Image credits: Quilt and fabric images are shown with the generous permission of Lonni Rossi. 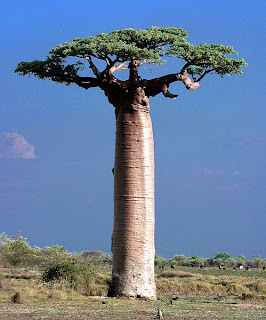 The photo of the giant Baobab is by Jialiang Gao and is licensed for use under the Creative Commons Attribution License. We recently met Janet Cook (in cyberspace) and we are thrilled to have a chance to show her work here. Thrilled, and slightly awed, in light of the fact that Janet Cook is a member of the prestigious Society of Designer Craftsmen in the UK. This organization dates back to 1887 and the Arts and Crafts Movement, founded by William Morris and his contemporaries. Janet Cook's work will be shown in the 2011 major exhibition, which opens this weekend in London*. Janet has created an amazing range of textile art that includes pieces inspired by landscapes, archaeology, and history. In each area of her interest she has pushed the boundaries of fabric art and craft, exploring new subjects, techniques and visual effects. Her magnificent "Opus Sectile II" is a collage of designs based on one of the greatest treasures of Westminster Abbey: the 700-year-old Great Pavement. "Consuo" means "I stitch together" in Latin, and the outstanding Consuo, shown above, was made to celebrate 20 years of quilting. This quilt shows the artist's progression into mosaic forms, using a mosaic technique to create the scene. Thousands of hand-cut pieces were bonded onto a background, then layered with chiffon before quilting. The 7 pointed star is Janet's logo, and it neatly coincides with the 7 colors of the rainbow. In the distance you can glimpse the bridge that is the subject of her distinctive Bridge Series (see below). The distinctive black-and-white border is an original block called "Crest of the Wave". The bridges, flower fabrics, and sewing machine are her photos printed on fabric, as is the picture of Janet in the center. You can see many intriguing mosaic quilts in her Mosaic Series Gallery. "Before the storm" is one of a series of quilts that depict a bridge before, during and after a summer storm. "Before the storm" evokes the energy, movement, dark clouds and restless waters that accompany a pending storm. The quilting lines remind us of sleeting rain, coming from the side at an angle, while gusts of wind create conflicting patterns and whorls. Do you want to see just how different - and tranquil - the bridge scene looks after the storm? 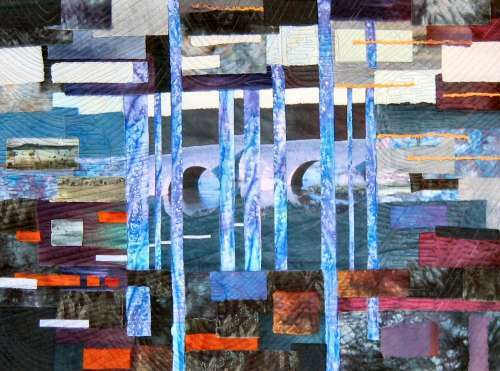 Visit Janet Cook's bridge series gallery. In "Consuo" you saw a distinctive black-and-white border, which is Janet's original "Crest of the Wave" design. Like a log cabin quilt block, the spirals can be laid out in a variety of ways. Take a peek at the brilliant diagonal Crest of the Wave and the spirals-within-a-spiral in Rock-a-Doodle Doo. Below you can see L'Or D'Automne (left), and Squirls (right), which are two more examples of this clever block. Several patterns are available for purchase on Janet Cook's patterns page. The symbolism of the moon and the hare is deeply entrenched in Celtic lore and history. The circular motif of three hares chasing each other appears in sacred sites from the Middle and Far East to Europe, and it occurs with the greatest frequency on the churches of the West Country of England. The marbled fabric used for the hares reminds us of the original stone carvings. In "Celtic Hares", Janet has placed the hares against the moon "to bring you good luck". The pattern is available on Janet Cook's patterns page. 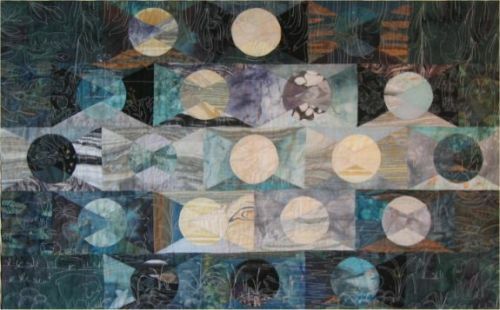 If you love this delightful quilt, you should check out her gorgeous Moon Hare art quilt which was shown in 2008 at the premier quilting event in Europe - the Festival of Quilts. Finally, did we mention how we first 'met' Janet Cook in cyberspace? We discovered her site while we were researching a quilt block called "Moon over the Mountain". During our quest, we came across the stunning art quilt - and free pattern - which Janet calls "Moon over the Valley." 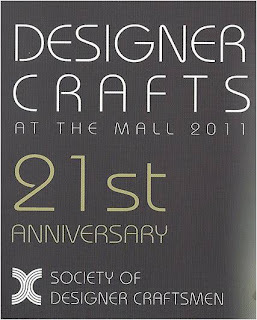 *SHOW OPENING: Designer Crafts at the Mall 2011 will be presented by the Society of Designer Craftsmen in January 2011 at The Mall Galleries, The Mall , London SW1 (near Admiralty Arch off Trafalgar Square). Opening January 8, through January 16. 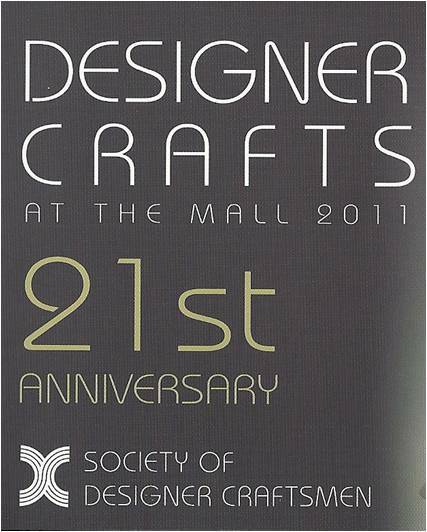 It will be a chance to view and buy works from some of the UK’s most innovative and creative designer makers. An ancient Japanese legend promises that anyone who folds a thousand origami cranes will be granted a wish. 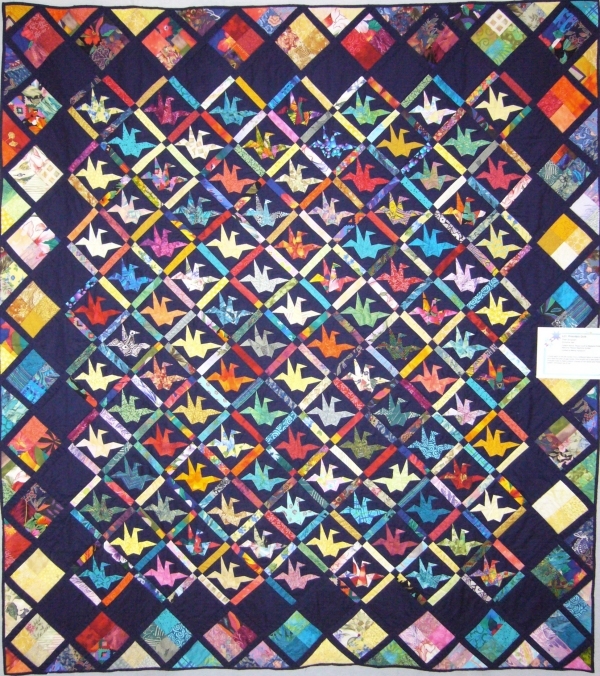 The Peace Quilt, 63 x 70, features a foundation-pieced Crane block designed by Margaret Rolfe (Australia). The quilt is made in Japanese fabrics. 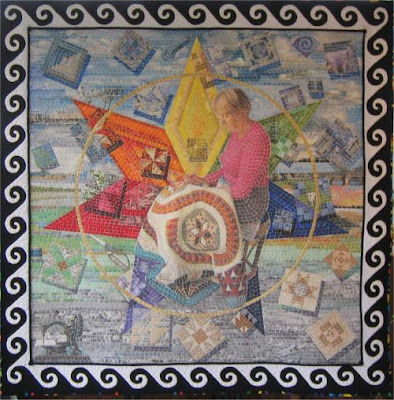 You can see images of the quilt on display at the 2009 Australasian quilt convention, along with a detail photo (below) by Anne Shea*. Anne blogged about the convention, and the peace quilt - and her own blocks - on her Pins and Thimbles blog. "This is our cry. This is our prayer. Peace on Earth." Image credits and links: Margaret Rolfe is an author, quilt designer, and quilt historian, who founded the Quilt Study Group of Australia. The Peace Quilt pattern is available at Margaret Rolfe.com. 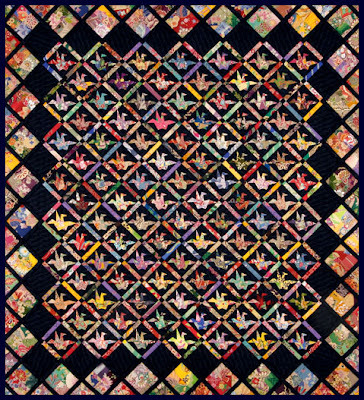 A brightly colored version of the Peace Quilt was an award-winner at the 2007 Rising Star Quilters Guild show. *The block image is shown with the generous permission of Anne Shea. Anne lives and works in Melbourne, Australia, where she makes clothes for tall women: see her online shop and blog at Sarah Vain and Tall. Year at a glance ! Amanda Herring is a Utah-based quilter and designer whose business - "The Quilted Fish" - refers to her last name. Her "Year at a Glance" quilt impressed us as a wonderful way to start out 2011, because it showcases all twelve months of the year through twelve blocks that display the growth cycle of a tree. Starting in the upper left of the three rows, we see the tree in winter, devoid of greenery; then the tree begins to form new growth in the fourth block, which represents the month of April. 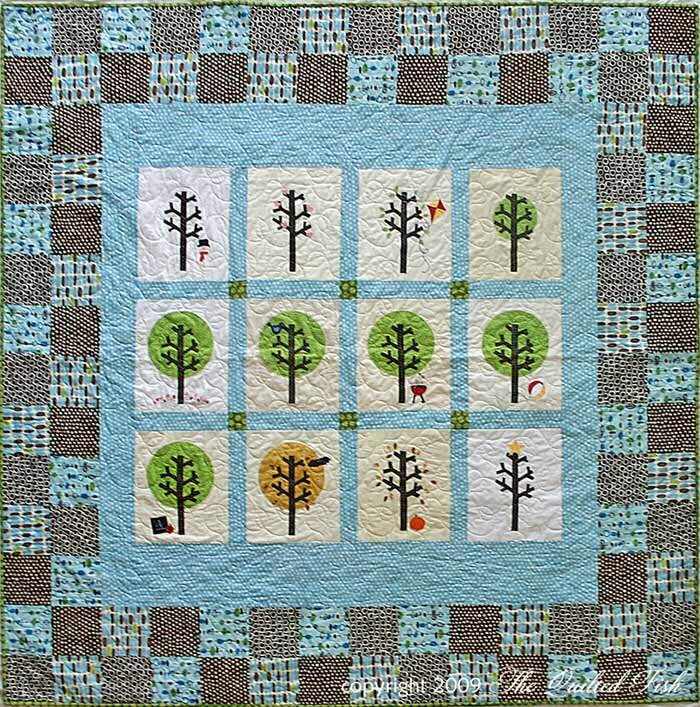 One of the cutest aspects of this quilt are the accessories that are appliqued near or on the tree to depict holidays or notable events of each month. If you look closely you will see the tiny hearts on the February tree, the little barbecue at the base of the July tree, the beach ball underneath the August tree, and the decorative star on the December tree. At an early age, Amanda became fascinated with all aspects of sewing and crafting. She pursued these interests throughout college, by studying art, art history, fashion design, and interior design. In addition to her many patterns, Amanda has designed for Moda Bakeshop pre-cut fabrics, where she has written easy-to-understand directions for piecing together Honeybuns, Layer Cakes, and Charm Packs into a simple and sophisticated quilt. In this new year, check out The Quilted Fish for more fun and creative projects and designs. Also look for Amanda's newest line of fabrics, which will be out in September 2011! Image credits and links: The image is shown with the generous permission of Amanda Herring. Amanda sells her "Year At A Glance" pattern at The Quilted Fish pattern page, and you can find updates for the pattern at her Quilted Fish blog.